The 270-WQ101 Submersible Temperature Sensor is a rugged reliable water temperature measuring device. 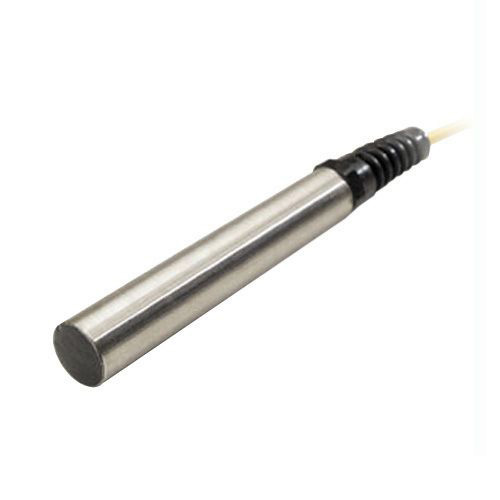 The temperature transmitter probe is molded to 25' of marine grade cable, with lengths up to 500' available. The temperature sensor has a two wire configuration for minimum current draw. The 270-WQ101 Submersible Temperature Sensor is a rugged reliable water temperature measuring device. The temperature transmitter probe is molded to 25' of marine grade cable, with lengths up to 500' available. The temperature sensor has a two wire configuration for minimum current draw. The temperature transmitter's electronics are completely encapsulated in marine grade epoxy within a stainless steel housing. The 270-WQ101 produces a 4-20 mA output signal which is an industrial standard signal for process control monitoring. Most PLCs (Programmable Logic Controller), RTUs (Remote Telemetry Unit), and data acquisition systems accept this signal directly. If a voltage signal is required, the sensor output may be converted by reading the voltage across a precision resistor in series with the signal wire. When the 4-20 mA signal is dropped across a 250 ohm resistor, the output will be 1 to 5 Vdc. If the 4-20 mA signal is dropped across a 125 ohm resistor, the output will be halved to 0.5 to 2.5 Vdc.